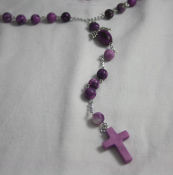 Handcrafted angel of Protection Rosary made from 8mm Sugilite beads. Blessed to empower the healing properties the gemstones. Sugilite is used by healers for dyslexia, pain relief, motor dysfunctions, gently draws out pain, headaches, inflammation, stress, disease, toxins, emotional blocks. Balances adrenal, pineal, pituitary, and left/right brain. Light colored sugilite is used to purify lymph and blood. Archangel Michael - He who is like God, protects and leads away lower energies in our space. He works with us while we sleep and enters our dreams to allay fears. Michael helps with the qualities of love, power, strength and unwavering faith. He gives guidance and direction for those stuck or lost in the purpose of their life career path. Michael is the Defender of the Element of Fire and of the South, the Leader of the Archangels. He is the Angel of Protection, Justice & Strength.